It’s more than just tracking the deer whenever the hunter finds a set of prints on the ground, and though the answer is pretty much an open debate for most experienced hunters, it could tell a thing or two about the targeted buck. 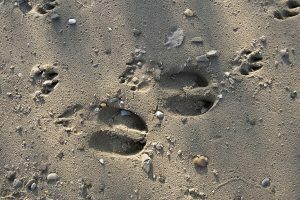 For some, footprints bring about the awareness of the animal being nearby or trailing them in the right direction. Of course, this is merely factual information that footprints are like arrows pointing the way. Deer are habitual creatures that have similar needs and travel in nearly similar routes. One thing to watch out for is a possible high volume of deer traffic in a particular funnel. There are times that more than one set of footprints may be found, in varying sizes and shapes of the hoof, or toes by most hunters. As for shape, they do tell an interesting fact about the buck. Of course, the deep the impression on the footprint can be the older bucks as well as the toes being a little rounder at the tip. This tells a story about a mature buck with massive antlers, possibly having to survive three ruts in its lifetime. It would be hard to contain the excitement, but there’s more to it at times. Larger doe can also exhibit a similar set of tracks, and possibly even a deeper impression once they’ve stepped on that part of the ground. There are times when some young bucks about a year old may seem small compared to older doe. So depending on the permit to also hunt down antlerless deer, they can be left alone or be used to an advantage, especially during a rut. A more populated set of footprints can tell a great deal about their habitat. When a hunter looks around and finds the things a deer needs to survive, like a river nearby, ample grass and vegetation as well as rubbings on a tree and how deep the mark is. It’s clear that a buck may return here and the best place to set up a proper firing position. The best tactic when it comes to knowing about a deer’s tracks and determining if the area is a good spot is to leave things undisturbed. Any animal may be unnerved to find a set of human footprints and just scamper away. Preparation on the hunter’s part is also the key as he showers with a scentless soap and has some tools to aid in luring the animal, it won’t be long before claiming this part of the forest as your personal and rich hunting ground.